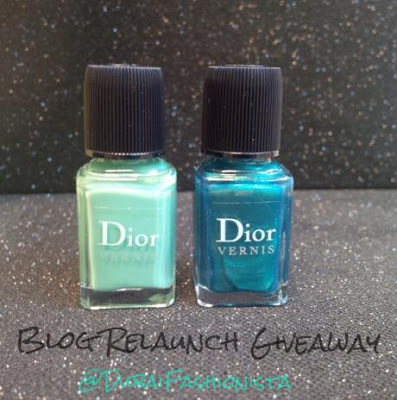 My dear friend , Dubai Fashionista is celebrating her blog relaunch by having a great giveaway ! She's giving away the amazing Dior Vernis "Bird of Paradise" Summer Collection duo in Samba (Sea Blue and Shimmering Peacock Feather Green). I love these nail polishes , so i entered , then i said that would be great if my dear readers get also the chance to win them !! I know , i'm a little late because there's only 2 days left to enter ! sorry! but hey better late than never!!! Visit Dubai Fashionista to see all the details of how you can enter !